A suspect, who was arrested for allegedly acting as a medical practitioner, has narrated how he carried out over 200 delivery of babies out of which one died. 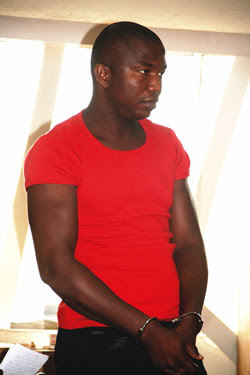 The suspect, who was arrested by detectives from the Area E Command of the Lagos State Police Command along side the owner of the hospital, who is a newspaper vendor in Ghana but also claims to be a medical doctor. The duo were arrested after policemen, led by the Area Commander, Dan Okoro swooped on Cares hospital, situated at Unity estate in Iba area of the state following intelligence reports. The Ghana-based vendor, Gabriel Onyema and the fake medical doctor, Nwankwo Stephen were on Friday paraded before newsmen by the state’police spokeswoman, Ngozi Braide. Stephen was initially employed at Cares Hospital to understudy the qualified doctor in charge but was allowed to take over when the doctor left. While fielding questions from newsmen, Stephen admitted being a fake medical doctor but claimed to have been an apprentice at an unnamed hospital in Ogun State.